APLAWCET-2015 and APPGLCET- 2015 are the Andhra Pradesh Common Law Entrance Tests for admission into LL.B 3/5 Year Law Courses and LL.M Courses in the Universities in Andhra Pradesh and their affiliated colleges. These tests are being conducted by Sri Krishnadevaraya University, Anantapur on behalf of Andhra Pradesh State Council of Higher Education, Hyderabad. 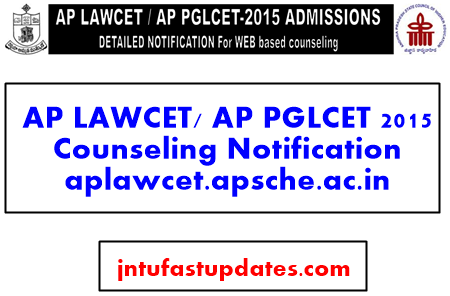 We welcome you to the web site of APLAWCET-2015 and wishing you all the best. The qualified and eligible candidates of APLAWCET/APPGLCET-2015 Examinations are informed to attend certificate verification for Web counseling for admission into LL.B,LL.B (Honors) (3- years courses) and BBA LL.B / BA LL.B / B.Com LL.B / BA LL.B(Honors) (5-years integrated courses) & LL.M courses for the academic year 2015-16 as per the schedule given below at any one of the following Help Line centers. 3-Year LL.B / BL: Candidates should have passed any Graduation (10+2+3 pattern) of a recognized University with 45% of aggregate marks or any other examination recognized as equivalent by the Universities concerned. 44.5% or more shall be rounded off and treated as 45%. The candidates who have less than the prescribed percentage but have secured the same percentage or more on the aggregate in any PG Degree (Masters Degree) or B.Ed are eligible. The candidates who have passed Degree examination by single sitting without undergoing three years course either through regular or private or correspondence and those who obtained the degree through open University directly without having any basic qualification for prosecuting such studies are not eligible for admission into LL.B Courses as per Bar council of India. 5-year LL.B / BL : Candidates should have passed 2 – year Intermediate Examination (10+2 pattern) with 45% of aggregate marks or any other examination recognized as equivalent by the University concerned or the Board of Intermediate Education, A.P. 44.5% or more shall be rounded off and treated as 45%. 1. There is a relaxation of 5% of marks in the above qualifying examinations for 3 year / 5 year Law course in favour of the Candidates belonging to SC / ST.
2. The applicants who have obtained 10 + 2 or Graduation / Post graduation through open Universities directly without having any basic qualification for prosecuting such studies are not eligible for admission into LL.B Courses as per Bar council of India. LL.M: Candidates should have passed LL.B / BL from a recognized University. Processing Fee: Candidates have to pay a non-refundable processing fee of Rs.900/- (and Rs.450/- in case of SC/ST) at the time of certificate verification. Note: 1. This notification itself is a call for counseling. No separate call letters are sent to the individual candidates. 2. Mere attending counseling does not guarantee a seat. 3. The students belonging to SC/ST/BC/EBC/Disabled/Minority categories will be considered for Reimbursement of Tuition Fee (RTF) / Financial Assistance to the students is subject to verification and eligibility criteria prescribed by the State Governments of Andhra Pradesh. Tentative fee payable now is subject to fulfilment of eligibility criteria, in case found not eligible the candidate shall pay the difference of fee. 4. Special category candidates (NCC / SPORTS / CAP / Physically Handicapped) for all courses LL.B 3years, LL.B 5years and LL.M are directed to attend Certificate Verification only at Acharya Nagarjuna University, Guntur on 09-09-2015 at 9: 00 AM.